Beetles are an extremely diverse species of insect, with more types of beetles in the world than practically any other within the animal kingdom. Of course, not all species of beetles are destructive pests, many types of beetles are very beneficial to the environment. If you have the misfortune to encounter a destructive beetle species in your home or work environment, contact our eradication team as soon as possible. There are an incredible amount of beetle species throughout the world, and naturally, different types all have varying lifespans. For example, some species benefit from an accelerated development and are able to produce more generations per year, while other species can develop much slower and reproduce far less frequently. A beetle’s life cycle can be broken down into four distinct stages. Other factors than can affect a beetle’s lifespan are the environmental conditions and the amount of food available for the larvae. Adult beetles often lay their eggs close to a food source for when the larvae hatches. Beetles generally eat a wide variety of animal and plant materials. Not all beetles cause havoc for humans, although there are some species in particular that are extremely destructive pests that have to be exterminated by professionals to ensure the problem ceases. We’ll be covering quite a few species and detailing their characteristics. The following are the most commonly found destructive species of beetles found throughout the United Kingdom. Anobiid Powderpost Beetle. Brownish-black in appearance and relatively small at about 3 to 4 mm in length. The anobiid powderpost beetle also loves to infest both hard and soft woods. Blister Beetles. Oval shaped and measuring approximately 1 to 2.5 cm. The chemical that is produced by blister beetles is named cantharidin and can burn skin if contact is made. Carpet Beetles. 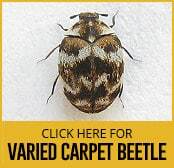 The larvae of the carpet beetles can be very destructive as they love to feast on natural fibres, woolen products, as well as feathers and other types of fabrics. Measuring just 1.5 to 4 mm in length, they are characterised by a distinct yellow pattern as well as black and white scales covering the body. Cigarette Beetles. Around 2 to 3 mm in length and yellowish-brown in appearance. Cigarette beetles infest a wide variety of stored products such as cereals and other dried foods. Common Furniture Beetles. As the name suggests, it’s a pest to timber based furniture. Common furniture beetles range 3 to 4 mm in length with a reddish-brown colouration to its oval-shaped body. Dried Fruit Beetles. Small black, oval insects that are characterised by the red or amber colouring on their antennae and legs. Dried fruit beetles also have two distinct amber spots located on their wings. Drugstore Beetles. These beetles are around 2 to 3.5 mm in length with an oval-shaped brown body. Drugstore beetles are well-known for feeding on a variety of dried products. False Powderpost Beetles. Wood boring insects that can infest both softwoods and hardwoods alike. False powderpost beetles can be distinguished by its black to reddish-brown colouration, while the insect’s length is approximately 3 to 6 mm. Flour Beetles. This beetle loves to infest various food products contained within a home, and are a particular nuisance in facilities producing food products, and shops that store vast amounts of food. Flour beetles are reddish-brown in appearance and comes in at 3 to 4 mm in length. Foreign Grain Beetles. Loves to attack food products in much the same way as the flour beetle, although more common in environments containing fungus and excess moisture. 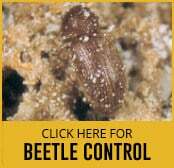 Foreign grain beetles are also reddish-brown with a body length of around 2 mm. Larder Beetles. Pretty large beetles at 6 to 10 mm in length, the body is black that also sports a unique white band going across the top of the elytra. Larder beetles infest a variety of dried stored foods. Pantry Beetles. This type refers to a large infestation of beetles. Pantry beetles also infest all manner of dried stored products. Pine Bark Beetles. As the name suggests, pine bark beetles primarily infests pine wood and any other softwood products. Plaster Beetles. Ranging in length from 1 to 3 mm, plaster beetles also come in a variety of colours from black to yellowish-brown and even reddish-brown. Sawtooth Grain Beetles. Characterised by the six small projections on the sides of their flat bodies, they are only 2.5 to 3 mm in length. Sawtooth grain beetles infests dried products like grain, nuts, spices, and can even penetrate packages containing food. Shiny Spider Beetles. Black or dark red in appearance, shiny spider beetles can be very small at just 1-5mm in length. Often, homeowners rarely see the presence of beetles, although the evidence of destruction caused by the pest is easily noticeable. Beetles can become a real nuisance unless dealt with quickly as they can damage your home, furniture, clothing, and food products. 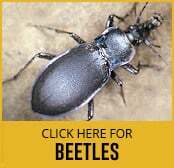 Our beetle combating team can and will remove all traces of this pest efficently.